Golf Croquet ("GC") is the simple form of croquet that forms the basis of many people's experience of the popular garden game. There are no bonus shots - each side plays alternate strokes and each tries to be the first to score the next hoop. This gives GC an interactive and social aspect that makes it a more accessible game than its more traditional cousin, Association Croquet, which is based on break play (like snooker, billiards and pool) which can mean that one player can spend a lot of time sitting down, unable to do anything to influence or interrupt the striker's progress. For a more detailed description of the game, see What is Golf Croquet? The latest version of the Rules is the 5th Edition, which was approved in July 2018. It may be found at Rules of Golf Croquet. Official Rulings and Commentary which took effect from 1 October 2018 may be found at Official Rulings and Commentary. For the supporting documents, see the WCF GC Rules Principal Changes and the WCF GC Rules Rationale. WCF Members are responsible for deciding when to bring the 5th Edition into effect in their domains. Until each Member does so, it will be necessary to refer to the 4th Edition of the Rules. These may be found at 2013 Golf Croquet Rules. The relevant Official Rulings may be found at 2013 Golf Croquet Rules - current Official Rulings. GC is believed to have been played in large gardens in England from about 1900 and was played widely enought to encourage H.F. Crowther-Smith to publish How to win at Golf Croquet in 1913. Sets of rules can be found dating back to 1902 and it seems that GC remained sufficiently well-established after World War I for the Croquet Association to formalise official rules in 1934 and for a GC championship to be instituted in 1935. However, until recent times, GC was generally regarded as a rather inferior form of croquet and all "serious" competitve croquet players were expected to focus on Association Croquet ("AC"), the game played with exactly the same equipment but, as noted above, based on break play and multiple-stroke turns. The turning of the tide occurred in 1988 when it was discovered that GC had been played competitively in Egypt since the 1950s and had reached a very high level involving hard hitting and running hoops from prodigious distances. The discovery was fortuitous and occurred when Geoff Roy, a British Airways pilot, who was also an English tournament croquet player, was assigned to routes including London to Cairo. On one of his trips, he decided to spend a day off in Cairo and found himself in Gezira Island which is in the middle of the Nile and forms the Zamalek distict in the centre of the city. The island is dominated by embassies and a large sporting complex that used to be the main recreational area for British administrators and forces personnel in the first half of the twentieth century. To Geoff's surprise, he walked past three fully-occupied croquet courts and introduced himself. He was immediately made very welcome and offered a game. The Egyptian players were keen to make contact with the wider croquet world and presented Geoff with two Egyptian-made plastic croquet balls (of regulation weight and size) to take back as proof of his discovery, rather like the dove that returned to Noah with a twig. Egypt soon joined the World Croquet Federation and Amir Ramsis Naguib, the president of the Egyptian Croquet Federation, is also the current President of the WCF. GC has since prospered mightily outside Egypt, first in England from the early 1990s and then throughout the rest of the croquet world. On continental Europe, it is now the predominant form of competitive croquet. The first GC World Championship was held in Italy in 1996 and won by Khaled Younis (EGY). The Egyptians won the next seven GCWCs (1997, 1998, 2000, 2002, 2004, 2006 and 2008) but standards outside Egypt were steadily rising and the next two GCWCs, in 2011 and 2013, were won by Mark McInerney (IRE) and Reg Bamford (SAF). Bamford's achievement was remarkable for several reasons, in that it was achieved in Cairo against the top Egyptian player, Ahmed Nasr, involved a recovery from a seemingly-impossible deficit of 6-2 in the final game and meant that he became the first person ever to hold the GCWC and ACWC simultaneously. However, the consensus was that Egypt remained the strongest GC country, especially in depth, and this was supported by the fact that Egypt had won the inaugural GC World Team Championship held in South Africa in 2012 and regained the GCWC through Ahmed El Mahdi in New Zealand in 2015 - although, interestingly, a New Zealander had defeated an Egyptian in the Under-21 GCWC that preceded the main event. Since then, there have been further indications that the GC balance of power may once again be moving away from Cairo. The 2016 Golf Croquet World Team Championship was held in England and New Zealand defeated Egypt in a dramatic final. The reputation of the New Zealand youth squad had been steadily growing and the semi-finals of the 2017 Under-21 GCWC held in Melbourne featured one Australian and three New Zealanders. All demonstrated very aggressive tactics based on extraordinary and consistent accuracy in long shooting. What is more, the youngsters made a significant showing in the main GCWC. The new U21 World Champion, Felix Webby, reached the semi-final and took Ahmed Nasr, twice a World Champion to a fifth game. The final between Nasr and Reg Bamford was seen as something of a "decider" given their earlier meetings in the 2008 and 2013 finals and Bamford prevailed again. The next U21 GCWC and GCWC will be held in England in July 2019. It will be fascinating to find out if the younger players really have rewritten the tactical rules and made GC a game for the young where the older players are definitely second favourites. (c) A match is a contest for the best of 1, 3 or 5 games of 7, 13 or 19 points. Each game ends as soon as one side (the winner) has scored a majority of the points to be played. Alternative endings which may be used include playing to a 2 point advantage or using a time limit. If the players leave the court or start another game having agreed which side has won, then the game has ended with the agreed result. A match ends as soon as one side has won the majority of games to be played in the match. (ii) When playing to a 2 point advantage, depending on the game played, if the first player to 4, 7 or 10 points is not 2 points ahead play continues, normally for a maximum of six more hoops or until one player has a 2 point advantage, whichever comes first. (d) The hoops are contested as shown in Diagram 1. In a 7 point game the first 6 hoops are played and the 7th point is scored by contesting hoop 1 again. In a 13 point game the first 12 hoops are played and the 13th point is scored by contesting hoop 3 again. In a 19 point game the first 12 hoops are played, then hoops 3, 4, 1, 2, 11 and 12 are played again as hoops 13 to 18 respectively. The 19th point is scored by contesting hoop 3 again. (e) The balls are played in the sequence blue, red, black and yellow. If the alternative colours are being used the sequence is green, pink, brown and white. After whichever ball was last played, the next ball in the appropriate sequence is known as the striker’s ball, and the owner of that ball is the striker. Commentary on Rule 3(c)(2): See also Rules 9(g) and 11(a). Commentary on Rule 5(e) If the first player to play has an air-swing, the game has started for timing purposes and if a non-striking fault occurs in the air-swing to allow it to apply. Commentary on Rule 6(a): (i) A turn starts when the striker strikes the striker’s ball and ends when the balls have come to rest or left the court. The next turn starts when the next striker strikes that striker’s ball. Between the two turns there is a brief period while the new striker takes up position or while the players make decisions about balls off the court, off-side or that had been involved in a fault. This period is not part of either turn. (ii) While the striker is preparing to play a stroke, touching the striker’s ball with the face of the mallet is a stroke, touching the striker’s ball with another part of the mallet is a striking fault, while touching another ball is a non-striking fault. (e) When two sides play simultaneously or nearly simultaneously, so that two balls are in motion at the same time, the striker is deemed to have played first irrespective of the actual order in which the two strokes were played and the other side commits a non-striking fault. If the commission of the fault affects the outcome of the striker’s play, the striker may choose to have all balls affected by the fault replaced in the positions they occupied before the strokes were played and to replay the turn. If the striker’s ball runs a hoop in order or causes another ball so to do after being affected by the fault, the striker may choose to waive the fault and score the point and, in that case, the other side does not lose its next turn. (f) When both players of a side play simultaneously or nearly simultaneously so that two balls are in motion at the same time the striker’s play stands and the partner has committed a non-striking fault. No replay is permitted. (g) A ball leaves the court and becomes an outside agency if more than half of it crosses the boundary. It remains an outside agency until it is next played. Unless it is directed to be moved as an offside ball it is played from the point where it crossed the boundary. A player may request that a ball off the court be placed on the boundary, or that the position be marked, before any turn. The referee or in the absence of a referee the ball’s owner is to determine the spot where the ball is placed. Commentary on Rule 10(c)(1): An offside ball only becomes an outside agency if it is directed to be played from a penalty spot. Once it has been directed to be moved it may be left where it is, sent towards the penalty spot or placed on the spot. However as an outside agency it is to be moved, at any player’s request, to avoid interference with play. A ball so directed remains an outside agency until it is played from the directed penalty spot. (2) If the owner of an offside ball plays before the opponent has given a direction under Rule 10(c)(1) and before the opponent has played, the opponent may require the stroke to be replayed after Rule 10(c)(1) is applied. Before the stroke is replayed any balls moved by the first stroke are replaced. A player required to replay a ball under this Rule is no longer entitled to rule on an opponent's offside ball at the same hoop. Reference to play by the owner of an offside ball in this rule includes play by the partner in a doubles game and play of either of the owner’s balls in a singles game. (2) if the ball does not belong to the striker’s partner, no points are scored for any ball and the opponents may choose to have the balls replaced or left where they stopped and to restart the sequence with either ball of their side. (f) If one or more wrong balls have been played but play is not stopped immediately then all points scored are counted for the owner of the relevant balls and play continues until the game ends or a wrong ball play is identified. Only the wrong ball play discovered immediately before play is stopped is dealt with, using Rule 11 (b), (c), or (d) as appropriate. Commentary on Rule 12(a)(1): If while attempting to play a stroke the striker touches another ball with the mallet, body or clothes, before hitting the striker's ball, the non-striking fault coming first cancels the stroke. In effect the striker has not had a turn. See also Rule 12(c)(4). Any balls moved in this play, whether directly from the touch on another ball or from the resulting hit on the striker's ball, are subject to the opponent's choice under Rule 12(c)(1). As the striker's attempt to play the turn is cancelled the same player is still the striker. The turn the striker loses under Rule 12(c)(4) is the turn the striker has attempted to play. The owner of the next ball in sequence becomes the striker. There is no further penalty. This is addressed again in the commentary on Rule 13(a)(12)&(13). Commentary on Rule 12(b): This includes damage in an air swing, or any careless use of mallet, feet or other equipment. Damage that breaks or dents the surface, so that a ball rolled gently over the damage may change direction, would be a fault. Damage that scuffs the surface but would not cause a ball to change direction is not a fault, nor is damage outside the boundary of the court. A referee or a player should immediately repair such damage, although the assessment is made before the damage is repaired. 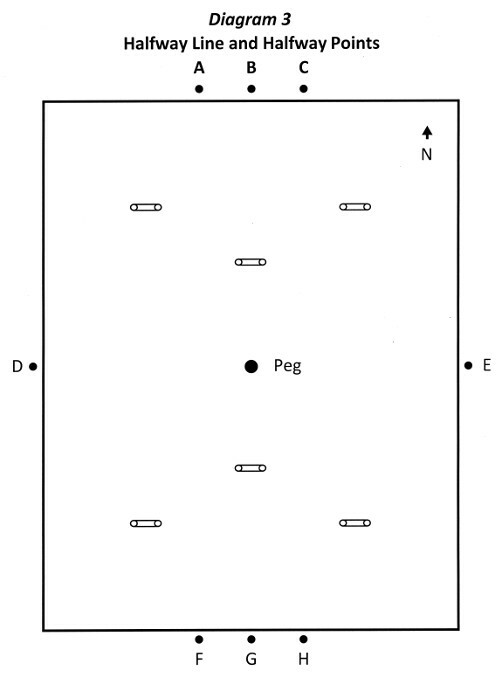 (2) If a non-striking fault affects a moving ball, the opponent chooses whether to leave the ball and any other balls moved because of the fault where they stop, or to have the moving ball placed where it would have stopped and the other balls moved replaced where they were before the fault was committed. However, if the outcome of the stroke was in doubt when a non-striking fault committed by the striker’s opponent occurred, the stroke is to be played again. (ii) The outcome of a stroke affected by a non- striking fault is in doubt if there was a reasonable chance that the ball would have finished in a critical position (hoop running or blocking position), would have cleared a ball from a critical position or would have run a hoop. If there is little chance of one of these happening then the outcome is not in doubt, even though the exact finishing position would be unknown. (4) The side that commits the non-striking fault loses its next turn. Should a non-striking fault be committed by the striker’s side, before the striker’s turn is played, then the turn lost is the current turn. Commentary on Rule 12 (c)(5): This rule says there is no remedy if play is not stopped after a non-striking fault and before the opponent plays. But Rule 12(c)(3) does not permit a hoop to be scored by such an action. It is unlikely that a non-striking fault that was not noticed immediately would cause a ball to run the hoop in order. However, if this did happen and was noticed when the ball’s owner came to play it, Rule 12(c)(5) says there is no remedy so the offender does not miss a turn, and Rule 6(j) says the ball is to be moved back to its agreed position (not through the hoop). (3) disturbing a ball he was trying to avoid when leaving a stance restricted (or changed) because of the presence of another ball. Commentary on Rule 13(a)(4): Although a striking fault can occur only after the striker’s ball is struck, and the actions covered by this rule occur before then, it is when the ball is struck as a result of one of these actions that it becomes such a fault. Commentary on Rule 13(a)(6): A “double tap” is likely to occur if a gentle shot is played with excessive follow through, or if a hard shot is played along the line of two balls close together. In the latter case if the two balls are less than 5cm apart a hard shot is likely to cause a “double tap”, even if played as a stun shot. Played with follow through a “double tap” may occur even if the balls are 15 cm or more apart. The excessive distance travelled by the striker’s ball will indicate this. Playing at an angle to the line of centres will reduce the likelihood of a “double tap”. Commentary on Rules 13(a)(12) & (13): Note that if the striker’s mallet or body touches another ball before hitting the striker’s ball a non-striking fault is committed. If the mallet or body touches another ball after hitting the striker’s ball but before leaving the stance a striking fault is committed. Under these rules both have the same consequences, so the distinction in this case is no longer important, except for Rules 16(f) and (g). If the contact occurs after the striker has left their stance then the stroke is valid, any points made are scored, but a non-striking fault has subsequently occurred. Commentary on Rule 14(a)(8): (i)A player may request that a referee, spectator, (or in the absence of these) a player, be appointed to time turns for all players. This "time-keeper" may be later dismissed during the game by mutual consent of the players. Commentary on Rule 14(c) This rule places a lot of responsibility on the shoulders of the players involved. Where possible any disagreement should be resolved amicably, otherwise a referee should be called. (a) The players in all matches are responsible for the fair and correct application of these Rules. A referee may be placed in charge of a match, or may be called on to assist, or may in specific instances intervene to ensure the match proceeds according to these Rules. The presence or absence of a referee does not change the obligation on a player to follow fair and correct play. Players are to warn the other side before playing strokes that may produce a fault or that are forceful. In the absence of a referee, if there is a difference of opinion on a matter of fact, the opinion of the player with the best view is to be preferred, but if two views are equal, the striker’s opinion prevails. (a) Handicap games may be played to allow players of different abilities to compete so that they will have more equal chances of success. Rules 1 to 15 above apply except as indicated in this Rule. Each player is allotted a handicap according to ability, ranging from zero for the strongest players up to 12 for the weakest players. 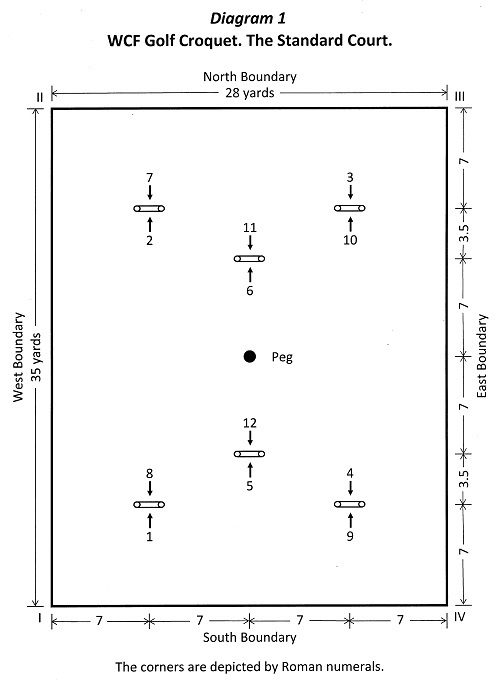 Commentary on Rule 16(a) National Croquet Associations where handicap matches are played may choose to vary the range of handicaps used in their matches. (b) In singles the weaker player is allowed a number of extra turns equal to the difference between the players’ handicaps for 13 point games and as shown in the table for 7 and 19 point games. (c) In doubles extra turns are given to a player, not a side. The lower (smaller) handicap on each side is subtracted from the higher handicap on the other side, and the difference is halved. The table below shows the number of extra turns available to the higher handicapped player in each comparison. When two players on the same side have the same handicap, they decide in advance which will be considered the lower handicapped player for the application of this rule. (d) No point may be scored for the striker’s side in an extra turn. (e) An extra turn may only be played by a striker at the end of that striker’s turn and is to be played with the same ball. A striker may play an extra turn at any stage in the game, and, if receiving more than one, may play extra turns in succession. This Appendix describes a system used to administer a Handicapping system for use with the WCF GC Rules. National Croquet Associations who play competitive handicap matches may choose to adopt the system as described here, to modify it to better suit their needs or to produce their own Regulations for handling handicaps. In the latter case, National Croquet Associations may select what is appropriate from these regulations. As in many handicapping systems a Golf Croquet handicap serves two functions. The self-evident one is to provide more opportunity for players to compete successfully against stronger players in special handicap competitions. The second purpose is to enable players to be placed in divisions or grades where they may compete against players of similar abilities. In matches where handicap play is being used, Rule 16 of the WCF Rules applies. Handicaps are initially set for each player using paragraphs 3 or 4 below. Thereafter they are changed automatically based on player’s success in both singles and doubles games as described in paragraph 5 below. Non- automatic changes in handicaps may also be made as described in paragraph 6 below. Players who are new to croquet may have their initial handicap set by the following procedure. Start from the fourth corner and count the number of strokes taken to run hoops one to six inclusive. Complete this exercise three times to the best of their ability. The total number of strokes over the three rounds is the grading score. This score is used to assess their handicap and index from Table A below. This will not be an accurate handicap as it measures only some of the skills and tactics needed. Players should initially play with this handicap and the automatic system will eventually obtain a correct value. Note that players should not be started automatically on 12, and it would be unusual to start a new player on less than 10. Players who start Golf Croquet with Association Croquet experience may have their handicaps and initial index set by Table B. The first column should be modified, if necessary, to fit a National Croquet Association’s handicap range in Association Croquet. Similar tables should be devised where other forms of croquet are commonly played. Golf Croquet Handicaps change when the player’s index points reach a trigger point for a handicap which is not their current handicap. They change immediately before the next game played, even if the next game is part of the same best-of-3 or best-of-5 match. The trigger points are shown in Table C. Table C also shows the range of index points for which the handicap on that line does not change. The maximum index is 1,000. The minimum index is 0. A player’s index normally changes after every competition game played, whether doubles or singles. However players whose handicap is 10, 11 or 12 do not lose index points, although their successful opponents do gain index points, and players whose index is 1,000 cannot gain index points, although their unsuccessful opponents do lose index points. Except as noted here the amounts of index change are given by paragraphs 6.1 to 6.4. In handicap singles games the winner’s index increases by 10 and the loser’s index decreases by 10. In handicap doubles games the indexes of both winner’s increase by 5 points and the indexes of both losers decrease by 5 points. In level games the winner’s index increases and the loser’s index decreases by the amount shown in Table D.
6.4 Index changes in level doubles games. In level doubles games the combined handicaps are found for each side. The difference is found, then table E shows the points gained by both winners and the points lost by both losers. Note: Players on a handicap of 10, 11 or 12, do not lose index points. Each National Croquet Association should organise a system for keeping track of Index changes and handicap changes. This may be through the use of index cards, tables or other means. Each National Croquet Association where Golf Croquet is played should appoint a National Golf Croquet Handicapper, and each club where Golf Croquet is played should appoint either a Club Golf Croquet Handicapper or Handicapping Committee. Set initial handicaps for new-to-croquet club members or experienced Croquet players starting to play Golf Croquet. Monitor the use of the index cards to ensure they are understood and used correctly. Watch for players whose improvement is outpacing progress on the card and recommend to the National Handicapper that a decrease in handicap be applied. Except where a handicap is grossly wrong such changes should be by either 1 or 2, with the index set to the trigger point for the new handicap. Listen to requests for handicap extensions and make recommendations to the National GC Handicapper. Such extensions should normally be granted only for a player returning to croquet after ill health. Gradual deterioration in play or a return in good health should be dealt with by the automatic system. Maintain a record of Golf Croquet handicaps for club members. Approve applications by Club GC Handicappers for non-automatic reductions or extensions. Non-approval would be rare and would only follow full discussion. Golf Croquet (or "GC") is the simple form of croquet that forms the basis of many people's experience of the popular garden game. There are no bonus shots - each side plays alternate strokes and each tries to be the first to score the next hoop. This gives GC an interactive and social aspect that makes it a more accessible game than its more traditional cousin, Association Croquet (or "AC"). AC is based on break play (like snooker, billiards and pool) which can mean that one player can spend a lot of time sitting down, unable to do anything to influence or interrupt the striker's progress. The opposing sides each have two balls: Blue and Black against Red and Yellow. Each side may be one or two people (i.e. singles or doubles). Each side plays alternately in rotation: blue, red, black, yellow, as shown by the sequence of colours from the top of the centre peg. Each turn consists of one stroke only: no extra turn is gained by running a hoop or hitting another ball (contrary to Association Croquet). To start the game, toss a coin. The winner of the toss plays Blue and Black, and Blue always starts. The opening strokes are played from within one yard of Corner IV (nearest hoop 4), and the players aim to run the hoops in order from 1 to 12. The winner is the first to reach 7 points. A deciding hoop (hoop 3 again) is run if the scores are equal after 12 hoops, making 13 in all. To score a point, a ball must run completely through the hoop in the correct direction. A ball has run a hoop if you can slide a straight edge down the front of the hoop without touching the ball. It may run the hoop in more than one turn, or be knocked through by another ball. If a ball should go through two hoops in order in the same stroke, both points are scored. The side that first gets a ball through Hoop 1 scores that point and then all balls go onto the next hoop in order (i.e. Hoop 2). All players always contest the same hoop. A player may play towards the next hoop before the previous hoop is run. However the opponents may ask that any ball more than halfway towards the next hoop when the current hoop is actually run, is brought back to a penalty spot halfway down the east or west boundaries. A ball that goes off the court is replaced on the boundary where it went off but may be temporarily moved if it interferes with the playing of another ball. The striking of the ball in a turn must be a clean, single hit; there are a number of faults that a player may make when striking the ball. These are listed in the detailed rules. After a fault, all balls are replaced in their positions before the faulty stroke and the player loses that turn. If a player plays a ball other than the one they should have played and it is noticed before the opponent plays, the balls are replaced were they were before the erroneous stoke and the same player then plays the correct ball. There is an exception when a player plays their partner ball. In this case, the other side can either have the balls replaced (as just explained) or can decide that the stroke should stand but the balls of the offending side are swapped. The other side plays then plays the next stroke. See the Wrong Ball rule (Rule 10) in the Rules for more details. To allow evenly contested games between players of different abilities the weaker player is given a number of extra strokes that can be taken at any stage of the game. However a hoop may not be scored for the player's side in an extra stroke. OR 1.1 When applying Rule 1(f) in a handicap game, any extra turns used during play for, and which include, the running of hoops out of order shall be restored. Time, in a time limited game, will not be restored in such circumstances. OR 5.1 If, in all of the first four turns of a game, the balls are played in the sequence given by Rule 1(e) but by the opponent(s) of the balls’ owner(s), then the first four turns stand and, for the remainder of the match, the ownership of the balls is as played in those first four turns. OR 5.2 Unless OR 5.1 applies, if the fourth ball played is a wrong ball and play is stopped immediately, then Rule 5(f) is applied. Any wrong ball play discovered from the fifth turn onwards is dealt with using Rule 11. OR 7.1 When applying Rule 7(f), if a ball jams in a hoop above another ball already in the hoop, replaying the turn is the only option available once the equipment has been checked and reset or replaced. 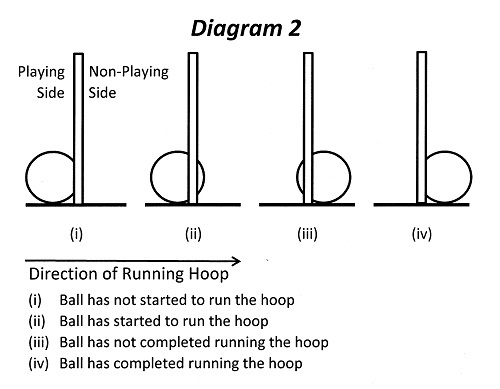 OR 7.2 If a ball is resting in a hoop before it becomes the hoop in order, when applying Rules 7(a) and 7(c), the hoop only needs to be the correct hoop in order immediately before a ball completes the running of it. OR 8.1 Players are not permitted to refer to printed, handwritten or other prepared material during a match, except for the purpose of clarifying the rules that apply to a circumstance that has arisen. OR 8.2 The words ‘off the court’ in Rule 8(e) should be interpreted as “outside the game”. OR 9.2 For the purposes of Rule 9(b), an immoveable outside agency on the court (e.g. a sprinkler head) is to be treated as damage that cannot be repaired. OR 10.1 If a player with an offside ball plays before a direction under Rule 10(c)(1) is given, that player is not entitled to subsequently rule on an opponent's offside ball (see 1st and 3rd sentences of Rule 10(c)(2)). OR14.1 Deliberately committing a striking or non-striking fault is an example of unacceptable behaviour under Rule 14(a). OR 14.2 The underlying principle of Rule 14(a)(7) extends to the deliberate or repeated playing of an opponent's ball, or to playing two or more turns in succession, or pretending to play a stroke so as to induce the opponent(s) to play two or more turns in succession. OR 14.3 Rule 14(a)(8) is to be interpreted as though the words “or other justifiable delay applies” is added to the last sentence. OR 15.1 If a situation does not appear to be adequately covered in the rules, or their interpretation appears to be uncertain, the issue shall be decided by the referee or, in the absence of a referee, by the players in a manner which best meets the justice of the case. OR 15.2 Where a stroke that may produce a fault is to be played, the striker should first request a referee or the opponent to watch the stroke. If the striker does not make the request, the opponent may forestall play and ask for the stroke to be watched.